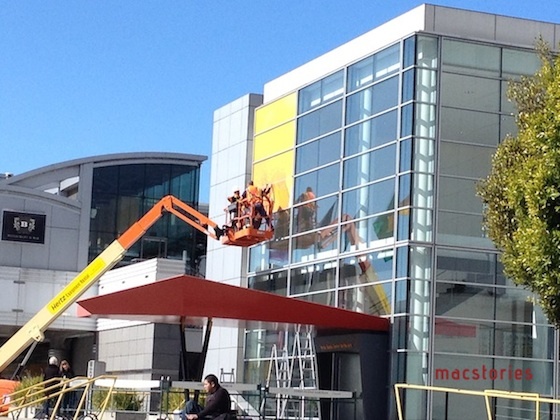 Read It Later developer Steve Streza has provided MacStories with a few photos showing that exterior work is underway on preparing the Yerba Buena Center for the Arts in San Francisco for Apple's iPad 3 media event next Wednesday. The company typically covers the theater's exterior glass wall with panels creating a large banner image, and this event appears to be no exception. The banners are typically tied into the graphics found on the event invitations, but it is not yet evident what the final image for this event will be once crews have completed their work. 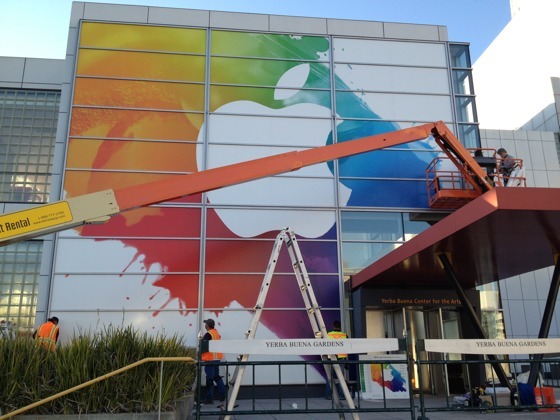 Update: The banner is almost complete, with the large white apple logo in the middle of what appears to be a vibrant splash of paint. Exactly. It could be an iCal update. It's yellow! Yellow? The sun is yellow. Sun? The sun is hot. Hot? Batteries can get hot. Batteries? BATTERIES!? BIGGER BATTERY MAYBE!?!?!?!?! I'm a grown man - is it wrong to feel this excited? I've just taken some more. Update: Work continues on the banner. Update2: Work continues on the banner. I love the anticipation as much as the next person, but 3 photos of people putting up a yellow piece of paper? That's canary yellow oh my god get it right! The banner that will launch a thousand rumors.